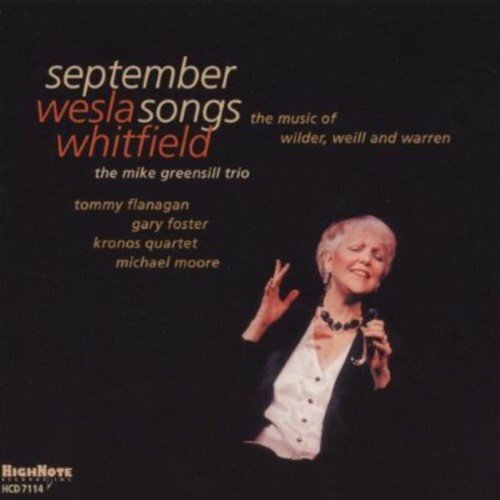 Any record by Wesla Whitfield is cause for rejoicing. This time out, however, is a special treat indeed, for this is without a doubt Wesla's most ambitious undertaking to date. Under the musical direction of Mike Greensill, Wesla is joined by the great Tommy Flanagan, reedman Gary Foster, their old friend Michael Moor on bass and the inventive and immensely popular Kronos Quartet for a program of music and songs by Harry Warren, Alec Wilder and the most classically-oriented of songsmiths, Kurt Wiell. Once again Welsa and Mike explore tje crevices between the hits and the chestnuts and have come up with an exciting program that mixes rarely-heard gems with some material that has, rightfully so, entered the pantheon of great American songs. If you have any questions about this product by HighNote Records, contact us by completing and submitting the form below. If you are looking for a specif part number, please include it with your message.